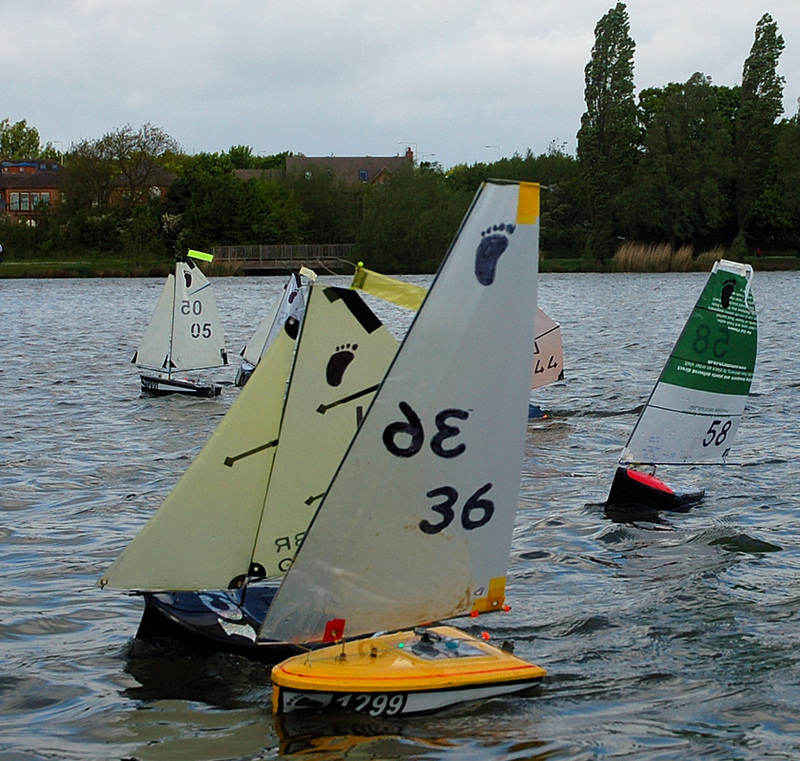 The forecast rain didn’t dampen the spirits of competitors, but the strong gusty wind made just getting round the course a challenge for Footys, as it was blowing and swirling around one of the islands of the ‘Two Islands RYC’ sailing water at Furzton Lake, Milton Keynes. 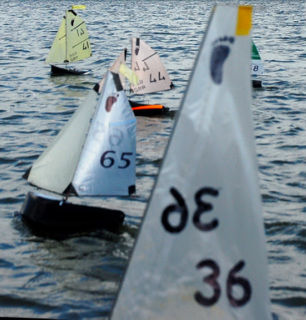 Despite the breakdowns caused by the strong winds, a total of 16 races were sailed around a simple windward/leeward course with a spreader mark and leeward gate. There were quite a few technical problems early on and PRO Roger Stollery always waited for all competitors to complete repairs before starting the next race. Right from the start it was clear that there were 3 competitors dominating the racing. 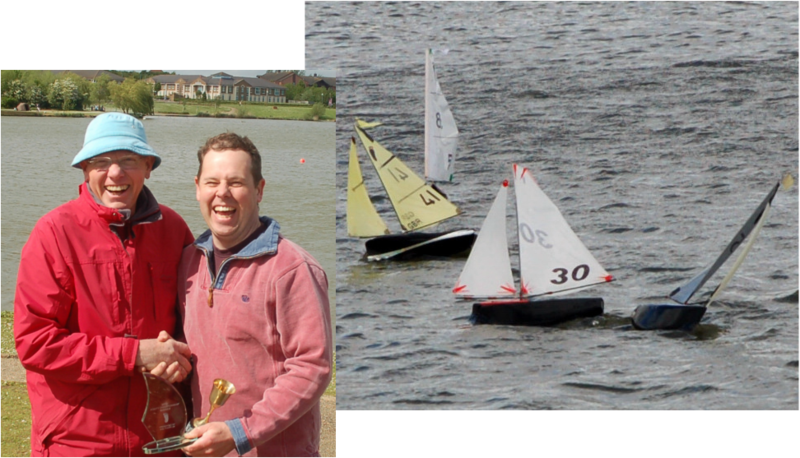 Rob Vice, sailing an ICE won the first 4 races, with Peter Shepherd, sailing a SLIM, getting 3 seconds and Peter Jackson, also sailing a SLIM, getting 3 thirds. Not to be outdone Peter Shepherd won Race 5, but then let Rob come back with wins in Races 6 and 7. The high wind was causing problems with the gazebo protecting the ‘race table’ and racing stopped for short time while this was dismantled. Peter Shepherd won Race 8, but was pipped on the line by Rob in Race 9. At the lunch break the scores were Rob 12, Peter S 17 and Peter J 25 points, whilst in the Junior Championship Lochie Vice was leading his younger brother Gabriel by 11 points. It was great to see these 2 boys continually referring to the scoresheet, keen to see how their scores were progressing. At the start of the afternoon’s racing the gusts became even stronger and more swirly. Peter Jackson enjoyed the more difficult conditions and won Race 10 from the other Peter and Mike Ewart, who was making the tall narrow balanced una rig work well on his 1299 boat to achieve 3rd place: his best result of the day. In Race 11, which was won by Peter Shepherd, there was another boat that got its best result of the event, with young Gabriel Vice gaining 6th place. Peter Shepherd won again in Race 12, with Peter Jackson 2nd and Rob 3rd. The latter changed back up a rig to win Race 13 in front of the 2 Peters. Gabriel was getting the hang of sailing his boat in the difficult conditions and scored his best result in 5th place. His dad succumbed to Peter Jackson in Race 14, where Trevor Thomas gained his best result of the event, also in 5th place. Rob made no mistakes in the final 2 races to take the Footy Championship with just a few points to spare. In the final race, David Wilkinson, who had had a series of problems during the event gained 2nd place, his best result of the event. Lockie extended his lunchtime lead by another 13 points, to win the Junior Championship Trophy. At the prize-giving Roger and Brian Hawkins were thanked for making up the race team at short notice, as the event had originally been planned to be sailed at Cotswold Sailing Club. 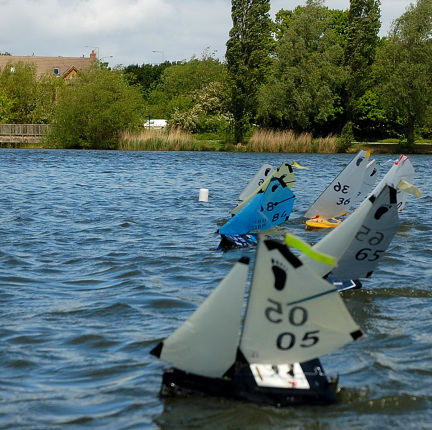 The experience of running a Footy event at Furzton Lake was well worthwhile as the biggest international event of the year, the Footy Gold Cup, will be run on Furzton Lake on 26/27 July. There are already 2 dozen entries including entries from Italy, France and Switzerland.